Hundreds of school children and many teachers are among those stranded overseas because of the volcanic ash drifting across Europe from Iceland. Many schools run trips at Easter and have been hit by the flight bans. In Hertfordshire alone, 352 children are stuck abroad on school trips in 11 different countries from Iceland to Hong Kong. One head teacher from London has told the BBC he could be short of up to 12 teachers on Monday. And a lottery winner has stepped in to bring back a group of school children stranded at a Dutch airport. 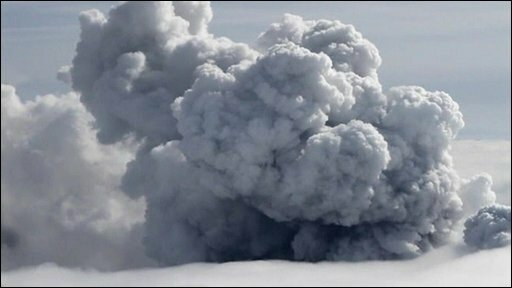 Flights across much of the UK have been grounded because of safety fears connected with the volcanic ash drifting across Europe from Iceland. Many schools are due to reopen on Monday after the Easter break. Mark Southworth, head teacher of Woodcote High School in Croydon, said he knew of 12 teachers stranded abroad - about 15% of his workforce. "Obviously we don't know whether they will get back in time. Some had been due to get back today. One of those is in Marrakech and can't fly back from there until Monday at the earliest," he said. "We have made the decision that we are going to open and are planning for the worst-case scenario, that 12 teachers are off and we think we can manage that." The school has contacted agencies to have supply teachers on stand-by on Monday. Mr Southworth said his school had learned lessons in the winter, when many schools were closed by snow, and had a very good system for communicating with staff and parents. The school was using its website and he was tweeting updates too. In Hertfordshire, children from 10 schools are on trips in 11 countries. The council has set up a hotline for worried parents. In Buckinghamshire, seven schools have groups abroad. Some should have flown back on Thursday or Friday. The others are due back in the next few days. Sue Imbriano, Buckinghamshire's director of children's services, said: "We are in contact with the groups and can assure families that the young people involved are being well looked after. "We will continue to monitor the situation and keep parents and carers informed." John Davis, head teacher of Moorlands Preparatory School in Leeds, is himself stranded in Spain. He says he will not be able to get back until Wednesday at the earliest because his insurers are refusing to pay for him to take an alternative route home. He said: "I should be back on Monday but there's no way I can get back to England. I am feeling very frustrated I don't like being away from school anyway and I am feeling frustrated that I can't get back." Mr Davis said he had been in touch with his deputy and that the school would still open as usual, but he predicted many families would also be affected. 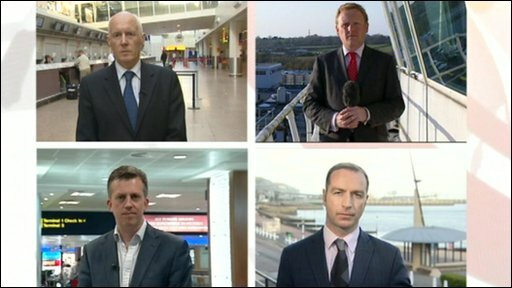 "My guess is that there will be probably be a lot of families wanting to return back to the UK, it being the last week of the Easter holidays. This is when they go on holidays." Tony Dugard, who won a share of a £2.2 million lottery win in July, was with a school party from Grimsby which got stranded at an airport in the Netherlands on the way back from a trip to Borneo in Indonesia. The pupils and teachers contributed £300 for a minibus ride from Schiphol airport in Amsterdam to Rotterdam and Mr Dugard paid £550 for the ferry crossing to Hull. "It was nice to be able to help," he said. Martin Ward, the deputy general secretary of the Association of School and College Leaders said: "No doubt many schools will be short staffed on Monday because of teachers being stranded abroad. "However, except in very small schools, this hopefully will not cause major disruption as schools have good contingency plans in place to cope with teacher absence. We will have a better picture on Monday when schools return for the new term."